July 2015 Voice: After a slow start to the beginning of the 2015-16 Legislative Session, the public hearings before the Joint Committee on Public Service are now in full swing. Several factors have contributed to this year’s slower start. During the last election cycle the House of Representatives witnessed the largest turnover in membership in decades. Several high-ranking members either retired or were elected to higher office, such as Boston Mayor Marty Walsh – a former State Rep. from Dorchester. Changes in the Senate were even more drastic, with the election of Stanley Rosenberg as Senate President and the ushering in of an entirely new leadership team. Rosenberg and several members of his inner circle have long been staunch supporters of public retirees. 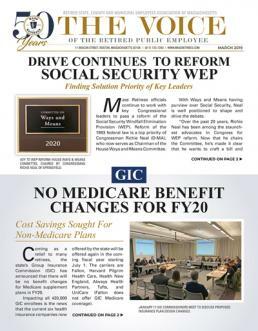 While new to leadership positions on the Public Service Committee, Senator Jim Timilty (D-Walpole) and Rep. Jamie Murphy (D-Weymouth) have a wealth of experience in working on the issues of importance to public retirees. Both have close relationships with local retirees within their respective districts. In mid-May, Public Service conducted a hearing on COLA legislation, as well as the issue of Option C recalculation. Both issues will likely be advanced favorably by the Committee within the coming months. The Committee has scheduled weekly public hearings through the months of June and July. Under the Massachusetts Constitution all legislative proposals must be granted a public hearing. Association officers are present at each meeting of the Public Service Committee and have close working relationships with Committee staff. The public hearing process is one of several steps for proposals (bills) through the legislative process. Committee members must weigh the pros and cons of each bill, as well as calculate the potential financial impact on the Commonwealth or municipalities.